Established in 1961, the University Bible Fellowship (Director: David Kim, photo) is a campus mission organization that has grown globally. The primary purpose of the organization is to teach the Bible, the Word of truth, to college students in Korea and overseas to help them acquire right views on life, history, and the world, in order to raise them as leaders equipped with faith and intellect. Currently UBF has 88 chapters serving 300 college campuses in Korea and 333 chapters serving campuses in 95 other countries. The most remarkable characteristic of UBF is its one-to-one Bible study, in which Bible teachers help students attain Biblical knowledge and also apply God’s Word practically in their lives. The organization works to produce and update Bible study materials for beginners as well as for growing leaders (photo). 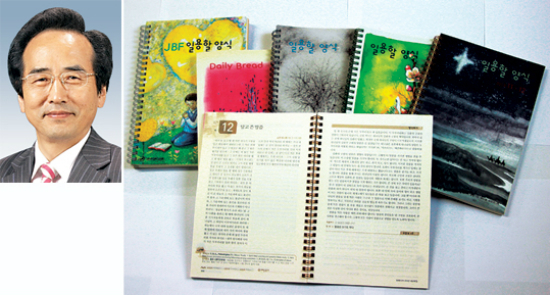 Every other month for the past 41 years, UBF has published the daily devotional “Daily Bread” in both Korean and English. The organization publishes Bible study materials for middle- and high-school students (Junior Bible Fellowship; JBF), and two series, “The Bible Is My Friend” and “The Bible Seen Through Characters,” for elementary school children.